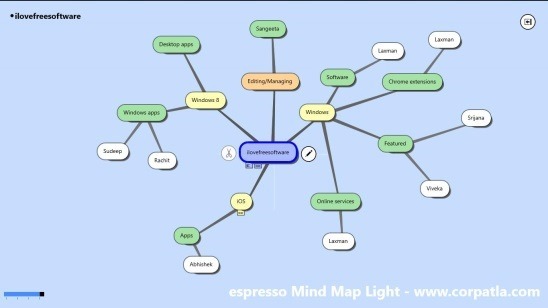 espresso Mind Map Lite is a free Windows 8 mind mapping app that lets you map your ideas and thoughts to a readable visualization, using nodes and line connectors. You can start by creating the main node (or the root node), which will be the initial point of your idea and then expand it further by adding as many nodes as you want. In this manner, you can connect node by node, and convert a small thought in your mind into a well branched visual representation. Basically, this free Windows 8 mind mapping app helps you in exploring your ideas with the help of diagrams, which have two main components: nodes and line connectors. The root node always remains at the centre, around which you can add several branch nodes and connect them by lines. The app lets you add as many branches to the main node as you want. There is no limit on the series of nodes. You can use different colors for the nodes, add a small description to them, and choose a shape for each from the three available options. Once you finish up with your idea, the app lets you export (save) and print the so made mind map. This Windows 8 mind mapping app is available under Productivity category in Windows Store. You can use Win + Q combo keys to locate the app in Windows store. Also there’s a link at the end of this article. This free Windows 8 mind mapping app is very easy to use and is quite straightforward. There’s no signup or login required, hence, removes all the cumbersome stuff. This app is just single screen app, and it opens with this screen directly. You can right away start mapping the idea/concept in this screen. The only rectangular box available in the screen is the root node. Simply type the root node’s name, and double click any where in the screen to add a new node to the root node. Again name this new node, and follow the same process to add further subsequent nodes. To add a new node to a middle node, simply select it and double click any where in the screen. This adds a new node to that node. In order to edit the text of a node, simply click on the Pen icon present besides the node. One of the biggest advantage of this Windows 8 mind mapping app is it lets you cut/copy-paste, and delete a node. And you can even use the traditional keyboard shortcuts for them; that is Ctrl+C to copy, Ctrl+X to cut, Del to delete etc. So now, you can easily cut-paste or copy-paste a node to another node, rather than creating a separate node. This not only improves the speed of mind mapping, but also makes it easy to use the app. You can also get the buttons for these options, by right clicking on this screen. Doing so opens two flyouts, one at the bottom and other at the top. The buttons available in these two flyouts are: Save, Save as, Open, Reload, New, Help, Cut, Copy, Paste, Delete, Undo, Redo, Print, and Export. These tools are pretty self-explanatory and using these tools is not hard at all! For those who like to go crazily creative while making mind maps, can also put different colors, shapes, icons to a node. These are the features that can make your mind map look more beautiful and interesting. Two other features: adding a Hyperlink to a node and description are the ones that I found very useful. Yes, you can add a particular website or a page URL to a node, and make your mind map more detailed and intuitive. Just double click on the node, and the URL will get opened in your web browser. Also if you have added a description than just put your mouse over that node to display the description. In order to get these node editing options, just click on the button at the top right corner of the screen. This is the only button available at that part of screen. Good Windows 8 mind mapping app. Supports cut, copy, paste, delete, undo, and redo functionalities. Add hyperlinks to a node. Opens with last opened mind map. Export a mind map as an image, HTML5, and espresso Mind Map file types. Also check out these four free Windows 8 To Do List apps. 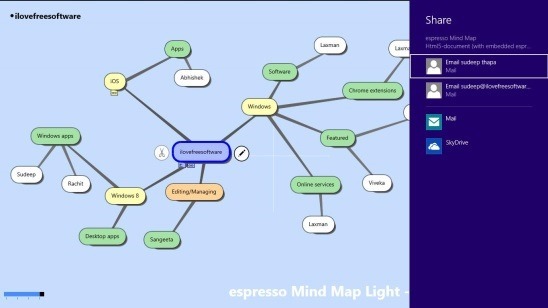 espresso Mind Map Lite is good option to choose as a Windows 8 mind mapping app. The app is easy, fast, and has a long list of usability features. They does make it a really strong contender as a mind mapping tool, though the interface needs a little improvement. All in all, a good free app to try! 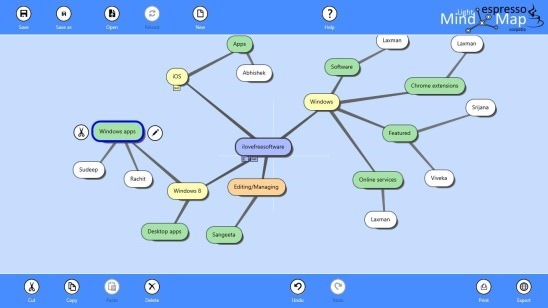 You might also like this free Windows 8 mind mapping app: NovaMind. 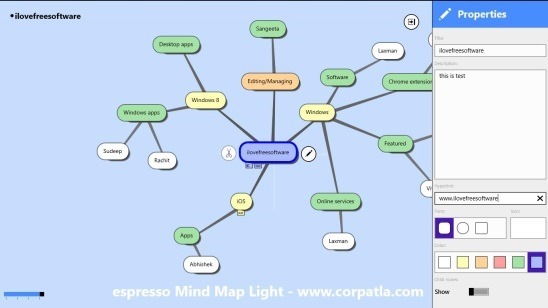 Get espresso Mind Map Lite here.